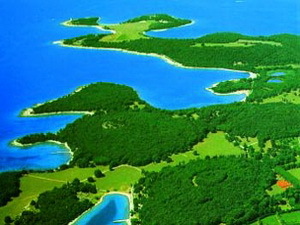 National park Brijuni is located on south-west side of largest Croatian peninsula Istria. Total size of national park is 33,9 km2. It consists islands, islets and surrounding sea. National park Brijuni used to be part of Istrian mainland around 10 000 years ago. Between Istria and Brijuni is Fazana Canal only 12 m deep and 3 km wide. Today's borders of National park Brijuni are determined in 1999. You can get to Brijuni by regular boat lines. Boat to Brijuni is included into the price of accommodation on Brijuni. Brijuni is located 240 km far from Croatian capital city Zagreb and 90 km far from town Rijeka. Climate on Brijuni is mild Mediterranean with hot summers and mild winters. This area has a lot of moisture in the air so it has rich vegetation. Average winter temperature is around 6ºC and average summer temperature is around 22 ºC. Sea temperature during the summer is between 22 and 25 ºC. Islands are consisted of layers of limestone with fat thick layer of brown soil. Rocks on Brijuni is ideal as construction material. National park Brijuni is consisted of 14 islands and islets. Lenght of coastal line of these islands is 46,8 km. Largest island is Veliki Brijun (Large Brijun) and second largest is Mali Brijun (Small Brijun). Islands of National park Brijuni are: Veliki Brijun, Mali Brijun, Okrugljak, Supin, Supinic, Galija, Vanga, Pusti, St. Marko, Gaz, Grunj, Vrsar, Kozada and St. Jerolim. Veliki Brijun (Large Brijun) has many beautiful grasslands and rich historical heritage. Old olive tree is one of the oldest olive trees in Mediterranean. In 1970's during a storm, this olive tree was broken in two parts.Olive trees are also important part of Brijuni's vegetation used for oil production. 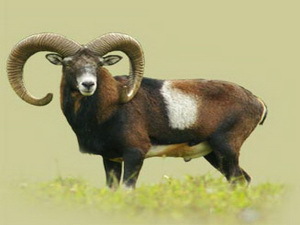 Many animals were imported to Brijuni such as fallow deer and deer aksis, mouflon. Other animals seen in Brijuni islands are: rabbit, sea-gull, spin. Most of the birds are situated in Saline. There are 3 lakes as ornithological reservation ideal for different bugs, birds, wild ducks, small fishes, hawks, herons. There are no many large animals in this area. Area of reservation Saline has 7 ha. In this area used to be salt pan. It is possible to see remains of salt pan on the coast. Most attractive resident on Brijuni islands is parrot Koki. It was parrot of Josip Broz Tito. It can be seen within elephantes. 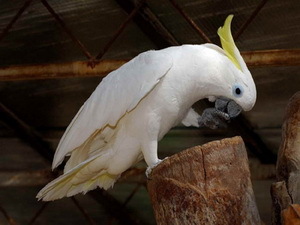 It is very social and interesting parrot. It loves bathing. Koki can talk some small sentences. On north part of Veliki Brijun (Large Brijun) is enclosed area safari park with size of 9 hectares made for large wild animals such as elephantes, zebras, camels, antelopes, sheeps, donkeys and Indian holy cow. Nilgau antelopes come from India. 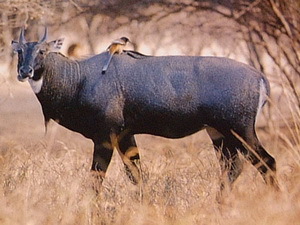 They are also called blue antelopes because of the color of males. Lamas are South America camals which do not have a hump and are smaller than real camals. Elephantes in Brijuni come from India. First elephant was a gift from Guinea which died in 1961. Elephantes weight 4-5 tonnes. Elephantes eat around 80 kg of food per day and can drink 6-10 l of water in just one sip. Donkeys of Brijuni are protected species as well as in whole Croatia. Dokeys had been used for cargo transportation. In Brijuni safari there are Istrian and Dalmatian donkeys. Inside of safari park is ethno park with autochtonous animal species of Istrian economy. It includes cattles, sheep, donkeys and goats. Istrian cattle called boskarin has light grey color. It grows until it is 6 years old. Istrian boskarin is in danger of extinction. Istrian sheep is larger and longer than regular sheep. It is used for milk production. In National park Brijuni there is possibility of autonomous diving. Well-indented coast, caves and cliffs are ideal for diving. Fishing is not allowed in area of national park Brijuni. 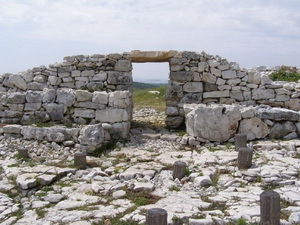 Brijuni islands keep monuments and ruins since Preromanian Istria. Many state officials from all around the world visited Brijuni islands. On island Veliki Brijun there were found footprints of dinasours. 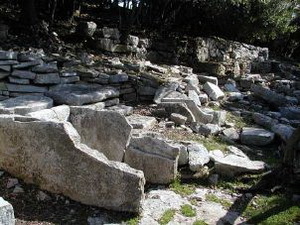 Footprints were found in locations Pogledalo, Ploce, Kamik and Trstike. It is discovered that most of the footprints belong to Theropods and Coelurosaria. Theropods were around 7 m long and its footprints are 115 million years old. Coelurosaria were 3-4 m long, aggressive and fast dinasours. Archeological monuments that you should visit are: Gradina, Kastrum, St. Mary Church, Roman villa in Verige bay. Gradina was settlement in Bronze Age. It is located on a hill and consisted of three belts of walls and 1 m wide west entrance Gnirs entrance. Around Gradina on hills are Ancient graveyards and family tombs. 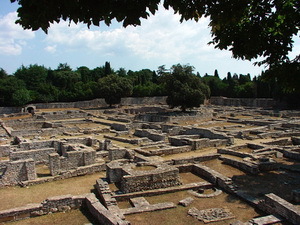 Kastrum is largest Brijuni location of historical remains. First villa on Brijuni islands was built in 2nd or 1st century BC, but it was ruined in 1st century BC. Second villa, built in area of first villa, had machines for oil and wine production and basements. In 4th century villa became a settlement. It had everything necessary for a community to live. Also walls around the settlement and basilica of St. Mary were built. Basilica was built in 5th or 6th century. Last known data about life in Kastrum come from Venetian times. In 1st century BC, on west coast of Brijuni, Roman villa was built. Whole estate was consisted of villa, temple of sea god Neptun, capitol trijad and goddess of love and beauty Venera, fish pond, summer cottage, thermae, economic sector. Access to the coast was regulated by chain (verige) which connected opposite shores. In 1984. photo exhibition of Josip Broz's life in Brijuni islands from 1947.-1979. In that time many world famous and important people visited islands. First state official person that visited Brijuni was Ethiopian emperor Haile Selassie in 1954. Josip Broz Tito got many gifts. Gifts were consisted of animals mostly, alive or prepared. Collection of those preparations are exhibited in 1986. Robert Koch (1843.-1910.) was a doctor, scientist and bacteriologist. Koch discovered cause of cholera and tuberculosis. In Brijuni islands malaria was present and Koch send his associates and visited Brijuni in 1900. and 1901. and discovered that mosquito with colorful wings was cause of malaria. In 1905. monument of Robert Koch was built in one of quarries. Paul Kupelwieser (1843.-1919.) was steel expert. In 1893. he bought Brijuni islands and made seaside resort. He turned Brijuni into beautiful place and ideal place for many important persons. He built hotels. Brijuni islands have been connected with Pula few times a day. Alojz Cufar (1852.-1907.) was responsible for vegetation on Brijuni islands, grasslands, cleaning, wood planting and quarry cleaning. In one of quarries monument in his dedication was built.